Pope Benedict XVI stressed his "deep respect" for Islam as he arrived in Jordan to begin a Middle East visit. He described religious freedom as a fundamental human right, and said he hoped the Catholic Church could play a role in the Middle East peace process. The Pope says he is going on his eight-day tour - his first to the region as pontiff - as a "pilgrim of peace". But Jordanian Islamist leaders have demanded that he apologise for a speech in 2006 that linked Islam and violence. After Jordan, the Pope's tour will take him to Israel and the West Bank. Only an hour after arriving on Jordanian soil Pope Benedict made a surprising reference to the ancient Semitic people who once lived in this part of the world. In Jordan's archaeological museum I saw some evidence of what he was talking about. A series of stunning but enigmatic white human figures up to one metre high, sculpted out of plaster spread over a skeleton woven from reeds. They look a bit like extra-terrestrial dolls with stylishly painted eyes. Archaeologists say they are more than 8,000-years old. They are believed to have been ritual objects used in ancestor worship. He was met at the airport in Amman by Jordan's King Abdullah, Queen Rania and Muslim and Christian leaders. The BBC's David Willey says the Jordanian royal couple broke protocol to greet the Pope in person. Normally they do not go to the airport to welcome visitors. King Abdullah welcomed the Pope to "the heartland of faiths for Christians and Muslims alike". The 82-year-old Pope praised Jordan's "respect for religion". The visit, he said, "gives me a welcome opportunity to speak of my deep respect for the Muslim community". He added: "Religious freedom is of course a fundamental human right and it is my fervent hope and prayer that respect for the inalienable rights and dignity of every man and woman will come to be increasingly affirmed and defended, not only throughout the Middle East, but in every part of the world." The Pope's visit is aimed at encouraging the minority Christian community in the Middle East, and creating a better dialogue with Muslims and Jews. Visit to a Jordanian mosque on Saturday and also to Mount Nebo, the site where the Bible says Moses viewed the Promised Land. On Sunday Pope gives an open-air mass and will pray at Wadi Kharrar on the east bank of the River Jordan, where Christians believe Jesus was baptised. On Monday Pope travels to Tel Aviv for four days in Israel and the Palestinian territories. While there he will visit a Palestinian refugee camp and is also due to visit Bethlehem in the occupied West Bank. As head of the Roman Catholic Church, he is seeking to strengthen ties with Jewish and Muslim leaders after offending believers of both religions in the past three years. 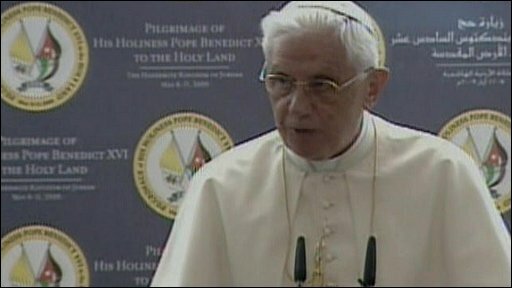 In 2006, Pope Benedict infuriated Muslims with a speech linking the Prophet Muhammad with violence. He later said he was "deeply sorry" over the reaction to the remarks and that the passage he quoted did not reflect his own opinion. In Jordan, speaking before the Pope's visit, the opposition Islamic Action Front party said the pontiff was not welcome unless he offered an outright apology. BBC security correspondent Frank Gardner says that anonymous jihadis have called for Pope Benedict's assassination during his stay in Jordan, branding him "the enemy of Islam". However, during Friday prayers at Amman's oldest mosque, a cleric told worshippers to welcome the Pope. "I urge you to show respect for Christians as they receive their church leader," Abdul-Qader of the Al-Husseini mosque said. Recently, the German-born Pope offended Jewish leaders by lifting the ex-communication of a Holocaust-denying bishop. Many in Israel have also been angered by the proposed sainthood of Pope Pius XII, reviled by some Jews for his passive stance during the Holocaust. During the visit - which includes a stop in Bethlehem, in the occupied West Bank - Pope Benedict is expected to deliver a plea for peace between Israelis and Palestinians, and for the establishment of a Palestinian homeland. But his main aim is to give hope and encouragement to the rapidly diminishing minority Christian community in the Middle East. Will the Pope's visit be a success?